Tax Treaty. Training by ActionAid. My Experience. 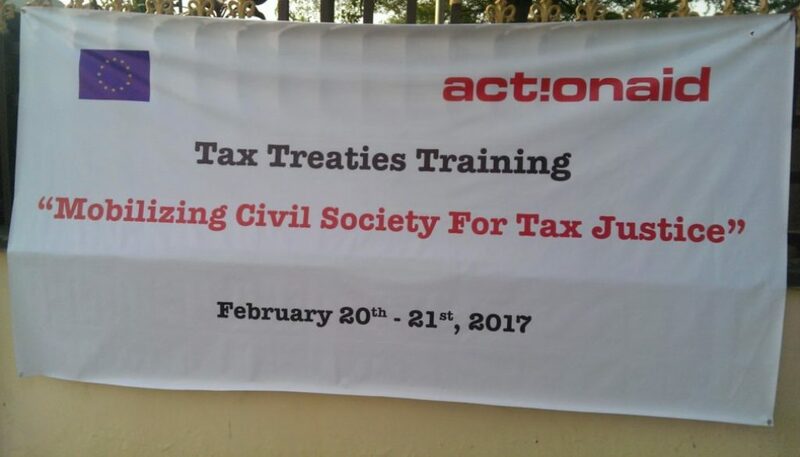 All these and more have been encapsulated in the reason behind the Tax Treaty Training hosted by ActionAid to bring to the fore, concise details of the Nigeria taxing system and the processes of Tax Treaties between Countries, most especially, Nigeria. Hosted at one of the Luxurious halls of Sandralia Hotel, Jabi, from 20th to 21st February. The First Day of the training was dedicated to elucidate and make more comprehensible – Tax and Tax Treaties. Coming in at Lunch, I was greeted by Kolo Kenneth who immediately handed a mini postcard sized paper to me, voila – a meal ticket. Headed straight to the lunch room. The rest is history! Funny, I was seated next to one of ActionAid’s speakers for the event – Lovisa Moller and we spoke for the entire period of the lunch. Lovisa Moller gave her insightful piece “Tax Treaties – a critical perspective”. Sliding through, she left no stone unturned as she explained the core of Tax and Treaties. “Tax Treaty is an agreement between two countries to divide up and limit taxing rights. Tax Treaties decide how much, and even if, the Contracting States can tax multinational companies.Tax Treaties are also known as Double Tax Agreements (DTAs), Double Tax Treaties (DTTs) and Double Taxation Conventions (DTCs)”. Rules are Neutral in theory, assymetrical in practice. OECD and UK model Treaties propose different versions. Moreso, ActionAid analysis of 519 tax treaties concluded that: Tax Treaties impose an unfair burden on lower-income countries compared to wealthier countries.A question was raised by Lovisa as to ‘why countries sign treaties’, the floor was aroused to action and heads began to sway in contention for answers. New markers attracts Foreign Direct Investment (FDI). Reduces taxes and ignites smoother investment . Moreover, in answering the question, she explained thus, “Tax Treaties attract more foreign investment – it can be assumed that Treaties will cause foreign investment to increase. The empirical evidence on the investment of Treaties is mixed. The potential revenue loss, especially to developing countries – including through ‘Treaty shopping’ – has caused increasing concern”. ActionAid’s International Policy and Campaign Advisor; Lovisa Moller gave some brief lessons in the history of Tax Treaties before moving ahead. 15 out of every 100 children die at the age of 5. Meanwhile, Nigeria is reputed as Africa’s largest economy, the continent’s largest oil producer and largest owner of natural gas proven reserves. These sharp contrasts between socio-economic state and resource abundance makes for compelling need to evaluate reasons for insufficient flows of funds to the government by businesses who should contribute their fair share to the development of the country. It creates allowance for tax evasion and (or) treaty shopping. Difficult to distinguish between genuine investors and “shell” companies. Nigeria being a net importer will remain so for the nearest future, the DTT by limiting the taxing right of Nigeria on dividend interest and royalty potentially reduces the tax base of the country which will.impact negatively on the revenue generation for the country. ActionAid however gave some promising recommendations on the above. It’s a praiseworthy effort from their part, of not only critically looking to the taxiing system but also giving lasting recommendations. 2. Place a special review focus on the Treaties with Kuwait, Mauritius, Belgium, China, Spain, and the United Kingdom, as these have been found to restrict Nigeria’s rights more than the norm. 3. Subject treaty negotiations, ratification, and impact assessment to far greater public scrutiny.I ended day one on a highly fulfilled note but understanding that Day two was pregnant with so much more, my impatience was steady. Day 2 started with a lot of innovative ideas around Tax, the moderator, Tunde Aremu was all around the hall fielding questions from participants and in return was checking on our level of memory retention – asking about lessons learnt on Day 1. He made startling, momentarily shocking revelations on how multinational companies have evaded taxes. Of all, he said “Firms like Deloitte have constantly aided and abetted countries on ways to avoid Tax payments”. So much more was made known within the hours of the training. It was also explained – the various types of Tax rights; Profit tax, Withholding Tax, Capital gains tax. We were asked to form clusters of CSOs, Journos to discuss challenges that beset Nigeria’s formulation of a concrete tax Treaty. Low level of awareness on implementation of the Tax Treaties. Excessive Conception of Taxing rights. There should be policy that is open and transparent and more private sector involvement / participation. Policies that allow participation of expertise around the specific Tax Treaty being negotiated. The MDAs should be up to their responsibilities in making public – any Treaty entered into. How can CSOs, POLITICIANS, GOVERNMENT OFFICIALS, MEDIA, LABOUR contribute to making these responses happen? Mapping our relevant stakeholders for Advocacy and Engagement processes. I leave you to ponder on these revelations, I was wowed upon seeing these, I hope you will, too. – Due to tax loopholes, corporations and political elites engage in illicit financial flows to tax havens where financial secrecy is in place or low tax levies enable them profit from the act.